v, 75 p. : maps ; 24 cm. prepared by the Congressional Research Service, Library of Congress by David M. Lindahl and Howard Useem at the request of Henry M. Jackson, chairman, Committee on Interior and Insular Affairs, United States Senate. use on an experimental basis. has proven to be both workable and effective. in any attempt to correct the shortcomings of the present system. shelf that is under the jurisdiction of the Federal Government. miles adjacent to the United States amounts to 6.22 percent of the world total. Source: Department of the Interior. jacent to the coasts of islands. ment Printing Office, 1972. p. 173. 0 50 100 200 300 0 Mi..
current OCS petroleum production takes place off the Louisiana Coast. that the data is preliminary at best. I Inferred reserves were derived for all regions based on historical data. mation; they are derived by statistical methods. 3 Negligible-less than 0.001 billion barrels. 4 Inferred reserves based on national onshore average. percent probability range in offshore Atlantic is 0-6 billion barrels of oil. 'Inferred reserves based on national onshore average. percent probability range in offshore Atlantic is 0-22 trillion cubic feet of gas. in the United States," circular 725, Department of the Interior, 1975.
three-mile marginal belts along their coasts. ment of the Submerged Lands Act. Reply To The Request For Comments On Potential Future Outer Continental Shelf Oil And Gas Leasing. June 5, 1974: p. 9. Colorado School of Mines, v. 65, n. 3, July 1970, p.2. 5 Public Law 31, Submerged Lands Act (67 Stat. 29, U.S.C. 1301 et seq.). held in an escrow fund. determine the location of the coastlines of the States involved. area in the Gulf of Mexico. other questions relating to the precise location of the coastline. Texas was admitted to the Union. the Pacific Ocean) are not yet firmly established. production, reduction of rentals or royalties, compensatory royalty agreements. easements necessary for operations or production. may prescribe at the time of offering the area for lease. 6 Pub lic Law 212, Outer Continental Shelf Lands Act (67 Stat. 462 43 U.S. C. 1331 et seq.). leasing public lands for oil and gas development to meet public needs. while assuring the public a fair market value return for the resource. per acre in "proven" regions. All rents are now uniform at $3 per acre. Public Law 14, Mineral Leasing Act of 1920 (41 Stat. 437, 30 U.S.C. 181 et seq.). Disposal Policies Hearings, 92nd Congress, 2d Session, June 19, 1972. Washington, U.S.
Govt. Print. Off., 1972: p. 38-9. May of 1975 a total of 5,249 tracts (oil and gas) were offered for lease. tract on which bids were received was 3.3.
high. Conservation and waste seem to have been treated as antonyms." IPercentage accumulated revenue of accumulated production value. Continental Shelf Statistics 1953 through 1974, June 1975, p. 49.
protection of environment, and (3) receipt of fair market value. ments, and inspections, are regulated by OCS orders issued by USGS. 1. Proposed Schedule-Provisional OCS Leasing. 5. Program Decision Option Document. Lyas and the Petroleum for Administration of Defense districts for oil. native schedules are tested with respect to the impact on demand. 4 .S. Department of the Interior, Bureau of Land Management press release, 1 75.
i48 deyeluus..5 A decision traot5 r i4ald any o( the loese sa. aud5W bed my .1 04-0 able scad.4. areas after covering several million acres off the coast of a single state. bility of the draft Environmental Impact Statement. information edge over the bidders. about $350 per line-mile or about $40,000 per standard tract. the data at a later date. information on any particular tract than dos the USGS. N A line-mile is one ship traveling in a line for one mile. 30, February 7, March 6 and 14, 1974. Washington, U.S. Govt. Print. Off., 1974: p. 404. 1. Description of the proposed action. 2. Description of the environment. 3. Environmental impact of proposed action. 4. Mitigating measures included in the proposed action. 5. Any unavoidable adverse environmental effects. and enhancement of long-term productivity. 7. Any irreversible or irretrievable commitment of resources. 9. Coordination and consultation with others. ited and unsolicited) and testimony from the hearing are analyzed. Council on Environmental Quality (CEQ). mation necessary to evaluate the total impact of the proposed action. to the Government and through the purchase of seismic information. indicates other factors that will be used in the resource evaluation. estimates, normally calculated using a discounted cash flow. areas already in production, before setting a minimum acceptable bid. price, discount factors, and taxation methods. ultimate development of the structure is required. formation developed in the environmental impat statement. nominations, usually takes approximately 12 months. 10 U.S. Department of the Interior, Bureau of Land Management. increasing the market share of a firm or of beiag anticompetitive. exceeds the equivalent of $3.00 per acre. for a tax savings of 48 percent of the amount of the bonus. rig and the depth of the water in which drilling is to take place. months, at which time it will be updated and a new "bidding period"
Shell Oil Company, Standard Oil Company of California, and Texaco, Inc.
leum firms acquired more than 61 percent of the OCS acreage leased. tinental Shelf Petroleum Leasing Policies," National Science Foundation, 1974. p. 17. 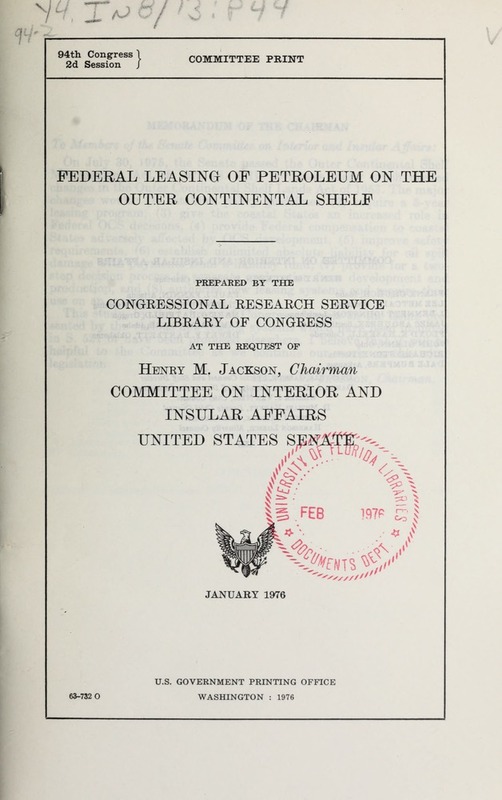 Outer Continental Shelf Petroleum Leasing Policies, National Science Foundation, 1974: p. 9-20. 'Clean Gulf Associates Oil Spill Contingency Agreement; exhibit B, percentage participation of members (July, 1972). 2 Moody's Industrial Manual-1972, Moody's Investors Service, Inc. New York, N.Y.
3 Offshore petroleum studies, Bureau of Mines Information Circular-IC 8557. & Not in top 20 producers; top 20 produced 97.7 percent of total. Source: Kash, Don E. and Irvin L. White et. al. "Energy Under the Oceans," University of Oklahoma Press, 1973, p. 94. El Paso Natural Gas -------------------------------------.. ...----------------------------------------------------------------------------------------------------------------------. ton; Standard Oil of Indiana includes Amoco and Pan American. Los Angeles, California; Metairie, Louisiana; Roswell, New Mexico; Tulsa, Oklahoma; Washington, D.C.
... ......... ...... ..... ...... ... ...... ... .::..k :: ..: :::. ........... .... ..... ................................... ... .... ...... A .
message that the 1975 target for OCS leasing would be 10 million acres. considerably less than ten million acres. can bear risk more easily than potential lessees. 14 Leland, olp. cit., pp. 2-3.
in increasing competition in the petroleum industry. supplies have led to a doubling in the price per barrel of crude. Consequently, bonus bids on desirable lease tracts have soared. increasing the riskiness of OCS operations. in accelerating production from our OCS. methods of leasing are being given increasingly serious consideration. trade-offs and compromises must be made. fall" profits either because of lack of competition or because of "luck." optimal level of environmental preservation will also be achieved. lease), the firm will limit production to OQ2 with the royalty lease. rate the earlier the shutdown. supply, and to higher costs to the consumer. Even though the U.S. I U.S. Code of Federal Regulations, section 2.50. 12, title 30.
of 121Y percent, the royalty rate is usually set at 162/3 percent. is to purchase a large number of tracts in order to spread the risk. the high interest rates that they must pay. 2 As noted earlier, an experimental royalty lease sale of 10 tracts took place on October 16, 1974.
bid; (3) potential environmental hazard; and (4) geologic and bottom hazards. ments directly transfer only market-price risk. under present conditions an abandoned field would ever be reopened. would be expected without a royalty payment. been employed on the OCS. experience in offshore oil development. development of some tracts (an extreme case of early shutdown). tinued production and not upon market conditions or production costs. it too quickly reduce reservoir pressures. basis of the percentage of the profit to be shared with the Government. greater it will be borne by the government. which would be a very effective means of reducing development risk. of the early shutdown problems, it could not completely prevent them. petroleum production and Federal revenues. royalty declines the burden of the risk shifts back to the firm. speculative operators may be encouraged. of capital expenditures, as well as other performance criteria. ment with tight control over the development and use of its resources. are no clear advantages in having an oil-payment bidding system. each bid would be for the entire field and not for a specific tract. ment. Risk decreases the supply and increases the cost of capital funds. high relative to its value. interested petroleum firms at a price just high enough to cover costs. ing but could also include the drilling of exploratory wells. visions for exploration and development, and 5) contract exploration. 7 Leland, op. cit., p. 60.
order to satisfy national energy rather than to maximize private sector profits. by under-reporting available supplies could be -met with reliable information. offered, and it would not be required to make any lease payments. Government competing directly with private industry. Government regulations, different output mixes may be obtained. public, then it need only pass legislation requiring such disclosure. Government corporation can provide a product at a lower cost. Record (daily ed. ), March 28, 1974: H 331-2332. Government corporation is more efficient. be effective in fostering competition in the petroleum industry. imports but not economically desirable to do so. M. Harrington, op. cit., p. 1 2332.
of leasing Federal oil and gas on the OCS needs a thorough review. &aqaard, P. i. Besse, C. P.
problems, arctic ice forces, and protection of the environment." business, v. 2, summer 1970: 443-478.
lawyer, v. 3, May 1970: 298-314. Allen, Alan A. Schlueter, Roger S. Mikolaj, Paul G.
California. Science, v. 170, Nov. 27, 1970: 975-977.
these slicks frequently wash ashore." huge offshore oil. Offshore, v. 34, Sept. 1974: 64-65. Protecting the North Sea environment. New scientist, v.
63, Sept. 26, 1974: 792-794.
per cent of the capital it invests." law quarterly, v. 1, spring 1971: 245-303.
make sound environmental policies concerning oil." review, v. 42, May 1970: 33-76.
procedures and agencies involved in offshore leasing decisions. 19f91 1 v. (various pagings). At head of title: Research report. 29, 1975: 12-14, 16, 18, 20.
when offshore drilling takes place. an interview. World oil, v. 178, Feb. 1, 1974: 23-26. East coast states ask leasing ban. Offshore, v. 31, Dec.
Atlantic outer continental shelf for oil exploration. A National Fuels and Energy Policy Study. Washington, U.S.
Govt. Print. Off., 1972. 21 p.
Atlantic offshore oil: preparing to take the plunge. Nation, v. 217, Sept. 10, 1973: 203-207.
bottom life, and the ocean's capacity to assimilate wastes. of the sea. Ocean management, v. 2, Apr. 1975: 267-280.
problems. Oil & qas journal, v. 70, Aug. 21, 1972: 59-66. "There is no quarrel with the aims of the regulations. have been achieved with less regulation and at less cost." economic review, v. 88, say 16, 1975: 63-66.
persons who may be contacted for assistance." offshore operators. Ottawa, 1973. 66 p.
Canada's "frontier" search. Petroleum press service, v.
the far north and the Atlantic offshore shelf in the east. first two areas and oil discoveries are north lacking. review, v. 10, spring 1975: 33-40.
minimum cost to the environment. March offering of Louisiana blocks becomes landmark sale. Offshore, v. 34, May 1974: 71-79.
offshore Louisiana in March 1974. The new sheikdom off the Jersey shore. Philadelphia, v.
66, June 1975: 162-164, 166-176, 178.
oil, v. 174, may 1972: 118-119. Conservative Party (Gt. Brit.). Research Dept. leasir.q. National journal, v. 4, July 8, 1972: 1109-1116.
leasing, including the system by which these lands are leased. resources journal, v. .14, Oct. 1974: 457-500.
countries: the U.S., the United Kingdom, Canada, and Australia. Study. Washington, U.S. Govt. Print. Off., 1974. 100 p.
At head of title: 93d Cong., 2d sess. Committee print. Norway. Journal of law & economics, v. 17, Oct. 1974: 213-263. Focuses on the economic dimensions of licensing policy. profitable both for their developers and for the nation." Offshore oil: America's trillion-dollar decision. Christian Science monitor, Apr. 15, 1974, p. 1, F4; Apr. 16, p.
F; Apr. 17, p. F5; Apr. 18, p. 7; Apr. 19, p. Fl. drilling in the United States. Doumari, George A. Dyas, Norma V.
pursuant to S. Pes. 222; national ocean policy study. Washinqton, U.S. Govt. Print. Off., 1974. 12 p.
technology. Louisiana law review, v. 31, Dec. 1970: 108-120.
the shelf with the minimum of friction with other nations. v. 35, June 5, 1975: 46-47, 49-60.
strike would bring. In Extensions of remarks of Robert E.
would face if there is an offshore oil strike. Emery, K. 0. Uchupi, Elazar. v. 70, Dec. 11, 1972: 156, 158, 160, 162.
coast and in the waters of the Gulf of Mexico and Caribe." v. 2, summer 1974: 137-149.
with the potential ocean-floor revenues and their disposition. Provinces of promise. Oceans, v. 17, summer 1974: 15-19.
reserves in offshore locations worldwide. New opportunities for offshore petroleum exploration. Technology review, v. 77, Har.-Ipr. 1975: 30-33.
will depend as such on political as on technological genius." Energy crisis focuses on Gulf. South magazine, v. ..
authority of reporting body. Minnesota law review, v. 57, Jan.
in international business, v. 2, summer 1970: 402-442. Riqhts of coastal nations to the continental margins. Natural resources lawyer, v. 4, July 1971: 668-675.
allow for maximum advantage to U.S. petroleum interests. Gardner, Frank J., and others. 1973: 77-83, 86-88, 90, 92.
v. 58, Feb. 1975: 49-54.
temptation to military solutions than the Middle East. Guttentag, Joseph H. Wilson, Michael G.
of attaining self-sufficiency in oil by the early 1980s." problems are money and people. v. 69, Dec. 13, 1971: 108, 110, 112, 114, 119-120.
industry and presents an estimate of that industry's potential. ownership of this area on the basis of the Submerged Lands Act." Sound waste management cuts offshore costs. World oil, v.
sea boundary lines of bordering states in the North Sea. Natural resources lawyer, v. 7, winter 1974: 67-76.
the Indian Ocean. Offshore, v. 35, Apr. 1975: 117-134. Mexico. Offshore, v. 34, Mar. 1974: 31-34. Offshore. Atlantic, v. 230, Aug. 1972: 74-79.
possible implications of the North Sea case judgment. The high cost of offshore oil. Offshore oil, V I, Jan.
sea technology, v. 11, Sept. 1970: 22-25, 36, 38. Oil & water: can they mix? Yield & stream, v. 79, Mar. 1975: 55, 149-150, 152, 154-156.
materialized. Today, the fishing around oil rigs is excellent." review of world affairs, v. 24, Oct. 1974: 4-7. 76, 93-100, 105-106, 108, 110, 112.
heavy emphasis still on exploration and development." adverse effects of that conflict." journal, v. 10, July 1970: 442-494.
lawyer, v. 4, Nov. 1971: 737-746. Lineup of top oil and gas producers in Gulf of Mexico. probably continue to do so for a number of years." 59-60, 62, 64, 66, 71-72, 75-76, 79.
the occasion of the industry's 25th anniversary. European neighbors shouldn't count on an energy bonanza. European Community, no. 185, Apr. 1975: 3-6.
and Norway and for Europe as a whole. no. 2328, Apr. 27, 1974: 80, 83-84.
in the Atlantic and the Gulf of Alaska. Louisiana Offshore Oil Scouts Association. January 1, 1S73; statistical review of events between July 1. Barbara earlier this year, including environmental aspects. Nationalism comes of age with discovery of North Sea oil. International perspectives, Mar.-Apr. 1975: 36-39.
coastal states seek changes in OCS leasing policy. National journal reports, v. 7, Feb. 15, 1975: 229-239. Massachusetts Institute of Technology. Offshore Oil Task Group. Office. Offshore Oil Task Group. petroleum developments. (Cambridge, 1973] 311 p.
journal, v. 72, Sept. 9, 1974: 65-67. Association urges reason in making offshore policies. Atmospheric Administrationi v. 3, July 1973: 4-9.
on regional income and environmental quality. technology and oceanology international offshore technology, v.
scale oil and gas exploration in the marine environment. Environmental protection in offshore petroleum operations. Ocean management, v. 1, Mar. 1973: 119-128. Association monthly, v. 55, Nov. 1973: 7-11.
potential along the United States Outer Continental Shelf." v. 72, Apr. 8, 1974: 36-40.
v. 10, Dec. 1974: 32-4. South China Sea and in East Asia. resources. Journal of maritime law and commerce, v. 2, Jan.
United States most be managed so as to protect the environment. market-demand prorationing should be abandoned..."
The selling of the shelf. Audubon, v. 77, May 1975: 44-63.
what conditions we shall drill for new oil and gas offshore. Santa Barbara: oil in the velvet playground. Ramparts, v.
platforms: a problem of applicable law under the Lands Act. Oreqon law review, v. 51, summer 1972: 813-825.
the Outer Continental Shelf Lands Act. products. tWashington, available from NTIS] 1972. 197 p.
Ocean petroleum resources; an interim report. f Washington) 19741. 39 p.
industry. riashington?] 1973. 90 p.
reports, v. 6, Apr. 6, 1974: 512-521; Apr. 20: 592-598. North Sea action takes lead from Gulf of Mexico. Offshore, v. 32, Nov. 1972: 33-37.
quarterly weekly report, v. 32, July 27, 1974: 1967-1970.
whether they should be developed at all, but only how fast." v. 33. June 20, 1973: 84-198. Offshore oil: Western Europe and Southeast Asia. policy: Norwegian policy affects oil. Oklahoma. University. Science and Public Policy Program. University of Oklahoma Press, 19731 378 p.
University of Oklahoma Press, 19731 31 p.
12-13, 15-16, 18, 20, 2,, 30, 35, 37-38.
exploration play in the North Sea and off the UK west coast. activity in this exciting petroleum search.". 1975: 12-14, 16, 24, 28, 30, 36, 39-40, 42, 47.
hold the spotlight in Canada's offshore exploration." v. 5, Apr. 13, 1974: 3-7. "Delaware's ex-governor fights to protect its coast." drilling activities in arctic Canada." The Politics behind the new oil hunt. Business week, no. 2166, Mar. 6, 1971: 104-106.
the responsibility of the Secretary of the Interior." Offshore gains take sting frcm onshore loss. Offshore, v.
76, 81-83, 86, 88, 93-94, 96, 98, 100, 104, 106, 108-112, 117.
new drilling. Offshore, v. 33, Sept. 1973: 40-41. Rogers, William B. Fakundiny, Robert H. Kreidler, W. Lynn. Norwegian oil: the 'blue-eyed Arabs.' Dun's review, v.
104v, Aug. 1974: 62-64, 66. Norway's newly launched state oil company. v. 32, May 1972: 36-38, 40. Investment potential of offshore drilling industry. Worth Sea oil: can the technology cope? New scientist, v.
56, Nov. 16, 1972: 380-382.
ecological consequences of North Sea oil exploitation. technology, v. 10, Oct. 1969: 32-34, 54, 56-57. Scott, R. W. Snyder, R. E.
energy policy study. Washington, U.S. Govt. Print. 0ff., 1971. At head of title, 92d Conq., 1st sess. Committee print. Is oil off East coast one answer to fuel shortage? U.S.
news 9 world report, v4 75, Dec. 24, 1973: 56-58. Florida Institute of oceanography, 1974. 455 p.
Update--outer continental shelf lease management program. Journal of petroleum technology, v. 26, Apr. 1974: 388-394.
v. 4, Nov. 1971: 732-736.
under the continental shelf regime." Barbara? Calif., 197071 8, (8] p.
recommendations on future oil drilling activities. Symposium on marine Pollution, Lcndon, 1973. Partial contents.--What is marine pollution?, by K.
by R. Page.--Ship sewage treatment and holding systems, by J. Stokes.--Vays and means of dealing with oil pollution, by A.
drilling, production and storage, by F. Didier. Examines offshore sites in Alaska and the Atlantic Coast. U.S. Bureau of Land Management. sale. rWashington, For sale by the Supt. of Docs., U.S. Govt. Print. Off., 19731 599 p.
Louisiana. (Washington, For sale by the Supt. of Dos., U.S.
Govt. Print. Off., 19741 3 v.
Texas. (Washington, For sale by the Supt. of Docs,, U Govt. Print. Off., 19741 2 v.
U.S. Congress. House. Committee on Appropriations. Subcommittee on Dept. of the Interior and Related Agencies. U.S. Congress, House. Committee on Government Operations. Mexico; nineteenth report together with additional views. Business. Subcommittee on Activities of Regulatory Agencies. report. Washington, U.S. Govt. Print. Off., 1974. 103 p.
and 28, 1974. Washington, U.S. Govt. Print. Off., 1974. 192 p.
Study, Ninety-fourth Cong., first sess. Washington, U.S. Govt. Print. Off., 1975. 2 v.
Hearings held Mar. 14...Apr. 9, 1975. Affairs. Subcommittee on Minerals, Materials, and Fuels. marine sanctuaries. Part 2. July 21, and 22, 1970. Washington, U.S. Govt. Print. Off., 1970. 187-446 p.
Affairs. Subcommittee on Hinerals, Materials, and Fuels. Santa Barbara oil spill. Hearings, 91st Cong., 1st sess. on S. 1219. May 19 and 20, 1969. Washington, U.S. Govt. Print. Off., 1969. 186 p.
Affairs. Subcommittee on Minerals, Materials and Fuels. S. 1951 randl S. 2339. Nov. 13, 1973. Washington, U.S. Govt. Print. Off., 1973. 49 p.
U.S. Congress. Senate. National Ocean Policy Study. the National Ocean Study Policy pursuant to S. Rea. 222. Washington* U.S. Govt. Print. Off., 1975. 81 p.
At bead of title: 94th Cong., 1st sess. Committee print. U.S. Council on Environmental Quality. U.S. Govt. Print. Off.] 1974. 5 v..
Comptroller General of the United States. (Washington] 1973.
constraints which may hinder its accomplishment." Barbara Channel area off the Coast of California." U.S. Office of Technology Assessment. from production of oil and gas on the outer continental shelf. Washington, U.S. Govt. Print. Off., 1975. 290 p.
Prepared for the use of the Senate Committee on Commerce. journal of transnational law, v. 9, fall 1970: 331-361. How long will offshore drilling be American-dominated? Oil & gas journal, v. 71, Dec. 31, 1973: 136-138v 140-141.
industry. New York, 1969. 31 p.
Weaver, L. K. Jirik, C. J. Pierce, H. P.
future oil supply from U.S. offshore areas to 1985." Weaver, L. K. Pierce, H. F. Jirik, C. J.
Weaver, Levis K., and others. hydrocarbon lease bonus bids in the Gulf of Mexico. "Supplement to Information circular 8557." bulletin, v. 59, may 1974: 15-16, 22-23.
associated with the OCS leasing program." Federal rules open new era in gulf. Oil & gas journal, v.
will cover the pollution aspect." lournal, v. 69, July 26, 1971: 64-66.
petrcleum technology, v. 26, Feb. 1974: 150-156. Proqram, Massachusetts Institute of Technology, 1973. (421 p.
(Massachusetts Institute of Technology. Sea Grant Program. Contents.--World energy and the oceans, by Dr. W. E.
Innovations in beat disposal in the oceans, by D. R. F.
Possible solutions to oil spillaqe, a growing problem. Suithsonian, v. 1, Nov. 1970: 19-27.
would be to have a non-petroleum econcy.